When trying to figure out a creative interpretation to this week’s Weekly Photo Challenge: Inside, I walked by my daughter who was in the middle of intently reading a book. The next day, I “set up” my shoot which means I asked her if she would be willing to be my subject for this week’s challenge and then I asked her to pick out a big book with a clear title. I was thinking of a nice big Dr. Seuss book, but she chose a different one with an interesting title yet one that would instill a bit humor since at ten years old, she would never choose to read this book. As I took several shots (she personally approved the ones you see here), she really read the pages. 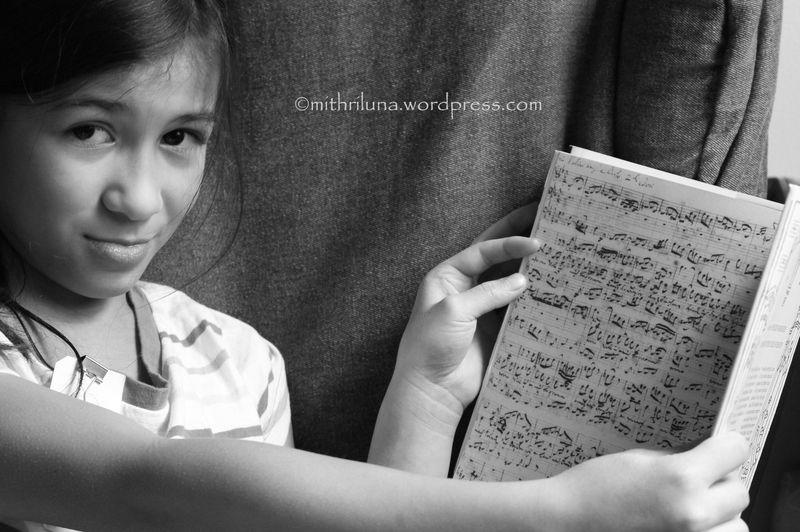 She settled on the inside cover of the book which contained the musical notes from one of Bach’s masterpieces and pretended to sing a tune. 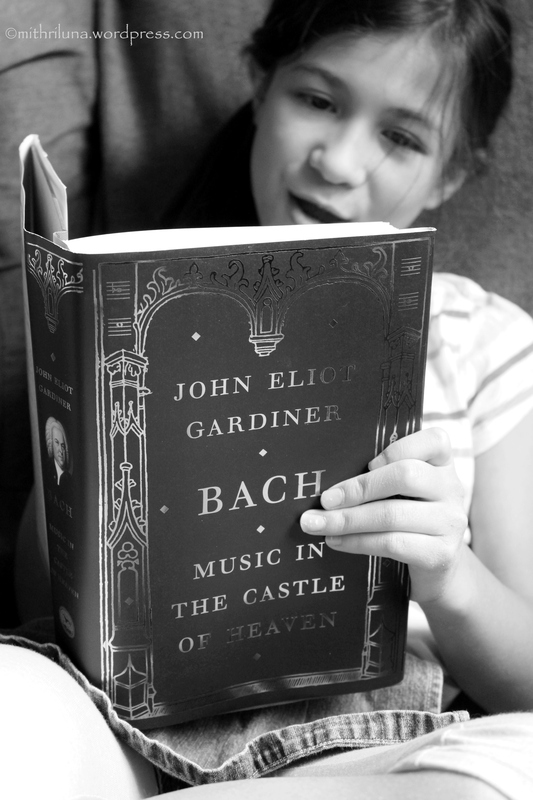 Since it is very common to find one or more of my kids buried in a book (for class or enjoyment), my older daughter was seriously reading a book right next to my “subject” so she is included in this photo shoot. Love the photos and the post. 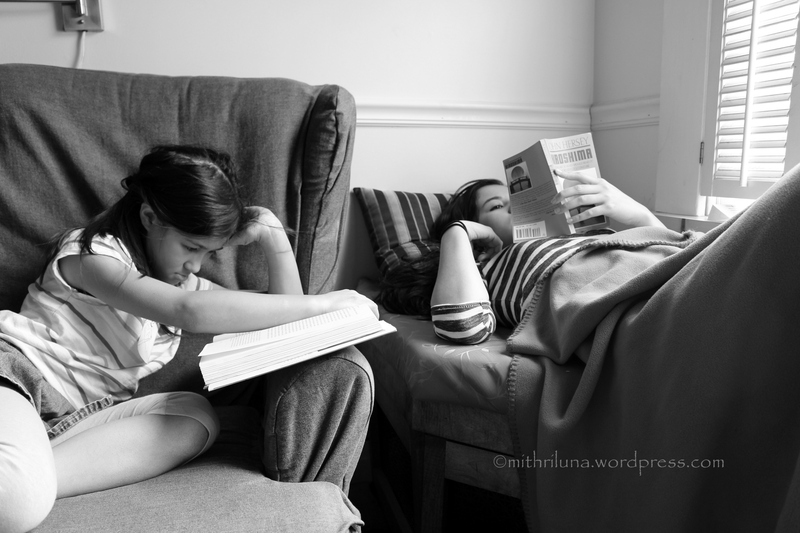 My girls are readers also … my daughter Deb who’s in her 40’s has over 2,800 … yes 2,800… books ! That’s down about 200 from when we moved 4 years ago. The 200 were either sold or donated to libraries by the way… no book would ever be destroyed here or thrown away. Yikes. Wow, Joan, that is a lot of books! Where does she keep them all? I love the Grouch Marx quote! I will have to share it with my daughter. oh wow, that’s really amazing!!! Ha! I first looked at the pictures and saw a young girl holding a very difficult read in front of her and thought to myself, “no way”… ha ha… Love your interpretation of the weekly challenge. Books are great, fantastic even. As an educator myself, I really enjoy seeing children read out of choice rather than need. Imagination – set it free! Haha. I agree with you, books are fantastic. Thank you! I love that she’s reading the notes. 🙂 Smart young ladies. Yeah, I didn’t even know that was on the inside cover. 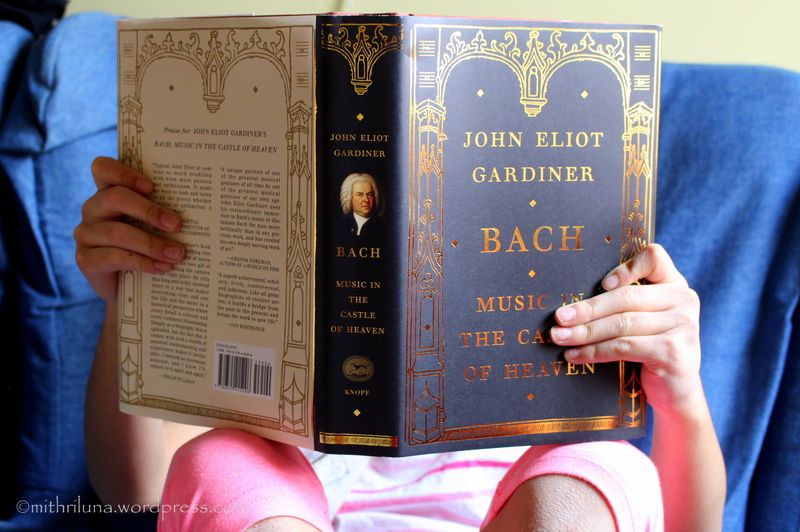 Obviously the book is not mine – it belongs to my oldest daughter, the pianist…but it looks like a very interesting read so I have put it on my reading list (which is super-long!). 🙂 Thanks Patti. How nice to see children lost inside a book. 🙂 The book your daughter is holding is very interesting. Imelda, I am so glad they love to read. Thank you so much for following my blog!